In fact, you probably have far more companionship in this experience than can be said for the tens of thousands of poor, lonely post-hole diggers currently sitting quietly in dark corners of garages across America, each patiently waiting to show their worth when another of your fence-posts someday needs to be dug up and replaced – even if that ‘someday’ is five years from now. Meanwhile, in most towns, somebody, somewhere, is in need of a post hole-digger almost every day. In short, we don’t all need to own post-hole diggers. And similarly, we don’t all need to own 20-foot ladders to get to those gutters clean-outs once a year, or tree-trimmers for the pruning we do once every five years, or tile-cutters for the once-a-decade when we get sufficiently inspired by a looming visit from our mother in-law to redo our guest bathrooms. The redundancy of each of us owning such items is both a waste of money and a waste of resources … not to mention how much space these things take up in our cluttered garages, workrooms, and basements. Thankfully, there’s a simple solution. It’s called a Community Tool Library. As the name suggests, a Tool Library is a place where citizens can borrow tools from a shared tool inventory, thereby reducing our collective need to purchase redundant, seldom-used tools, and providing new opportunities for those with limited tool access. And of course, you don’t have to be a homeowner to use the Tool Library. Whether you’re working on a community service project for a local nonprofit, building an affordable home with Habitat for Humanity, cleaning up a park with your church group or neighborhood association, restoring a trail with a local environmental group, or merely building a small piece of furniture – the Tool Library is there to lend tools to any individual or nonprofit organization that needs tools to complete their work. Tool Libraries currently operate in more than two dozen cities nationwide, including: Austin, Berkeley, Buffalo, Cedar Rapids, Columbus, Kansas City, Missoula, New Orleans, Oakland, Philadelphia, Portland, and Seattle. 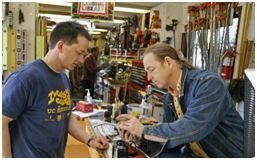 All of the tool libraries enjoy enthusiastic support from their communities and report rapidly growing consumer demand. Portland, Oregon, for example, has just opened its third community Tool Library in the last five years. The Berkeley and Columbus Tool Libraries have each been operating continuously for more than 30 years, with Berkeley loaning more than 50,000 tools in 2009. To watch a recent ABC News feature story on the West Philly Tool Library please click here. What kind of Tools will be available at the Tool Library? The Tool Library is currently targeted for launch in the summer of 2010. We’ve secured $6,000 in matching funds, putting us halfway to our current target. The CRC is a 501(c)(3) non-profit organization, donations are tax-deductible. If you have any questions about the Boulder Tool Library, or would like more information about how you can further assist our efforts, please contact Adam Jackaway at 720-771-9813 or email adamjackaway@yahoo.com. Next Topic: How Do We Move Towards Sustainability?